NYCC officially got underway tonight with a special sneak peek at the upcoming animated Harley Quinn show and Doom Patrol, both coming to DC Universe, the new DC Comics streaming service that will kick off soon. DC Universe surprised fans tonight with a pair of Doom Patrol and Harley Quinn announcements during the world premiere screening of Warner Bros. Television's highly anticipated action-drama Titans at New York Comic Con. Doom Patrol's Brendan Fraser and The Big Bang Theory's Kaley Cuoco made special appearances to reveal some exciting casting news and to unveil a first look at Warner Bros. Animation's upcoming series Harley Quinn. Titans debuts October 12, 2018, on the DC Universe digital subscription service, with new episodes unveiled each Friday. Brendan Fraser announces that Matt Bomer has joined the Doom Patrol, and Kaley Cuoco is Harley Quinn! After those announcements filled NYCC with cheers, Warner Bros. 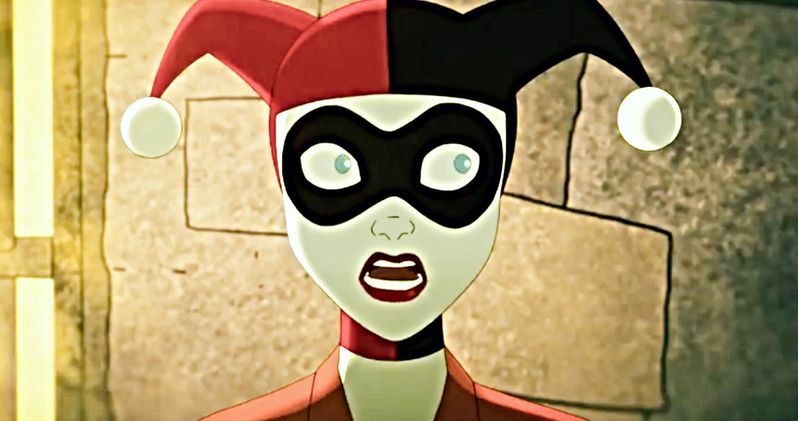 Animation then unveiled a first look at the upcoming animated Harley Quinn series with a special video created specifically for NYCC, which you can see in all its glory below. Immediately following the video, the new voice of Gotham's criminal Queenpin Harley Quinn was revealed, as The Big Bang Theory's Kaley Cuoco took the stage. A beloved presence at any Comic Con for her role in The Big Bang Theory, Cuoco delighted fans with the news of her taking on the role of the madcap Ms. Quinn. Cuoco leads a strong voice cast which include comedic talents such as Lake Bell (In a World..., Wet Hot American Summer series, Childrens Hospital), Alan Tudyk (Rogue One: A Star Wars Story), Ron Funches (Powerless), JB Smoove (Curb Your Enthusiasm), Jason Alexander (Seinfeld), Wanda Sykes (Black-ish), Giancarlo Esposito (Breaking Bad), Natalie Morales (Bojack Horseman), Jim Rash (Mike Tyson Mysteries), Diedrich Bader (Veep), Tony Hale (Arrested Development, Veep) and Chris Meloni (Happy!, Law & Order: Special Victims Unit). In addition to voicing the role of Harley Quinn, Cuoco is also an executive producer on the series through her Yes, Norman Productions, serving alongside Justin Halpern, Patrick Schumacker and Dean Lorey. Prior to the Titans world premiere, Brendan Fraser (Crash, The Mummy, Gods and Monsters) took to the stage to share some updates directly from the set of Doom Patrol. Fraser is starring in the series as the voice of Robotman, and he will also portray Cliff Steele in flashback scenes. Fraser revealed that Matt Bomer (White Collar, American Horror Story, The Normal Heart) has also joined the Doom Patrol team. Bomer will provide the voiceover performance for the character of Negative Man, and he will also appear as Larry Trainor in flashback scenes. Bomer further surprised fans with a special video greeting from the Atlanta-based set, exclusively for those in attendance at NYCC. In addition to Fraser and Bomer, Doom Patrol stars Joivan Wade as Victor Stone/Cyborg, Timothy Dalton as Niles Caulder/The Chief, April Bowlby as Elasti-Woman, Diane Guerrero as Crazy Jane and Alan Tudyk as Mr. Nobody. Check out the first look at the animated Harley Quinn show with this video released during NYCC by Warner Bros. TV.